Commissioned in 1633 by Sir Archibald Acheson, Charles Is secretary of state for Scotland. Acheson House was restored in 1937 for the 4th Marquess of Bute. and the door below is from a demolished building in Anchor Close. 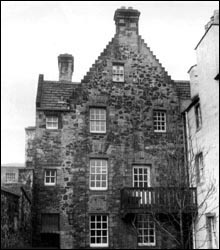 On the east side of the close, the original frontage to the House may be glimpsed behind its courtyards wall.